I am currently in my eighth month teaching abroad in Seoul, South Korea. Having just graduated from Wilfrid Laurier in December, I left for Seoul in April, which gave me three months at home to adjust my mindset into post-university mode. It dawned on me that I had been in school for the past 21 years of my life, so it is safe to say the adjustment was somewhat difficult, and I had a few hopeless moments where I felt completely lost. Suffice to say, the decision to leave my family and country for a year was just the ticket my mind and soul needed to adjust to a career lifestyle. I did not hire a recruiter to find my job here in Seoul. This may seem unsafe or reckless, but when I looked at my bank account after graduation, I didn’t think I could justify spending more money at the time. Luckily it has worked out for me; however, some people will definitely urge you to find a job abroad through a trusted company or recruiter. It seems to be a risk either way, so I decided to take a chance. My school has been respectful of paying me on time every month, without any problems. If you have heard anything about foreigners teaching in South Korea, punctual payment is a recurring problem you will have read about. The application process was somewhat discouraging at times. I had a few promising jobs that fell through at the last minute. Eventually, I began conversing with a Korean who said he could get me a job at a small school named ESE in the heart of Seoul; my ideal location. I jumped on the opportunity. He set up a Skype time for me to be interviewed by the boss of the school. The 14-hour time difference made it slightly difficult, but we managed to finally talk, and after she saw my face and heard me speak English, she essentially hired me on the spot. Two weeks later I was boarding a plane headed for Seoul! The key to finding a job online is to be available to talk at almost any time, and to be persistent. Recruiters will tell you they have a job, and in some cases, if you don’t respond within a day, they will move on quickly. It’s a fickle business. You may wonder how a broke graduate is able to fund a trip of this magnitude. The beauty of Asia is the prices for mostly everything are much cheaper than Canada. I can have a delicious, three-dollar dinner of fresh vegetables and chicken from the local market beside my apartment. As well, the cost of rent is significantly lower. In downtown Toronto, for instance, you spend an arm-and-a-leg for a one-bedroom apartment. In Seoul, my school covers my rent. I only have to cover utilities, which are about 100 dollars a month. As well, I have been living without a (gasp) cell phone! This is unheard of in the birthplace of the Samsung Galaxy S3, however it has been saving me over 100 dollars a month, so it is well worth it for me. I am happy to say that eight months into my Korean adventure, I have paid off more than half of my university debt! It isn’t always easy to be cheap, but for me, it has been well worth it. I will be honest; my first month here was really difficult. I felt excluded at my school because I was the only foreign teacher. I worked with four Korean girls who seemed gossipy and uninterested in getting to know me. The teaching was difficult for me as well. My students range from four to eight years of age and it seemed like they didn’t know any English at all. Since I don’t know any Korean, this was a huge problem for me. I felt like I was talking to a brick wall every day. However, I held my chin up and pushed through. After I got into the swing of life in Korea, I started making more of an effort to get to know my Korean co-workers. It turns out they are all lovely people with interesting stories, and now I hear all the gossip: one girl is going to be marrying her fiancée in two months; another girl is constantly going on blind dates; and another girl asks for my advice regarding her boyfriend and their dating situation. How are you dealing with the cultural divide? It is my eighth month here in Seoul, but if you asked me in my first month whether I thought I would still be here now, I would have said no. I’m not going to gloss over my experience and tell you everyone is friendly, hardworking and positive. In fact, I have noticed that this country seems to be somewhat focused on keeping up appearances in the workplace. My boss seems most interested in impressing our students’ parents, to the point where some other things I think are important simply slip through the cracks. 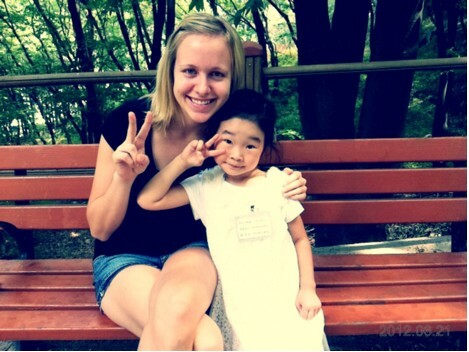 One story that exemplifies South Korea’s emphasis on impressing parents revolves around an “Open Night” at my school in my second month teaching at ESE. This is an evening where the school invites all the parents to come and watch their kids being taught by the teachers. We are supposed to simulate a real classroom experience so the parents can have a glimpse of their children’s daily lives. But the night could not have been more different than their daily classes however. Teachers and students were asked to prepare for this “performance” a full month in advance! The kids essentially memorized a script so that when teachers asked them questions in front of the parents, they appeared knowledgeable. I felt like an actor on stage that night, especially since parents were filming me and snapping pictures the entire time. It was such a staged operation and being involved in it really gave me an unusual insight into South Korean culture. This is a once-in-a-lifetime experience that most people will never have the courage or dedication to follow through with. Once you’re in a foreign country, soak in as much culture as you can. If you are invited by a new friend to go to a museum or festival, never pass it up. Remember it is only one year of your life, so even if some days are difficult, it’s not going to last forever, and you will get through it a stronger person. If everything seems hopeless, your family is only a phone call or email away; and if worse comes to worst, home is only a plane ticket away. This experience is 10 per cent where you are placed, and 90 per cent what you make of it. What I mean by this is, I could have given up and been miserable after my first month, but I put a fake smile on every day even when I was feeling lonely, and before I realized it, I was truly enjoying myself. And you never know what doors will be opened to you if you travel abroad. If you are a recent graduate and unsure of what step to take next, this might be the experience you need to help you get through the adjustment period. You might realize teaching is your passion, or you might realize it is not for you. Either way, the experience is priceless and unforgettable. What are your future plans for your career and traveling abroad? I don’t think I’ll be a teacher upon my return to Canada, but I will always have a soft spot in my heart when I think about Asia and my somewhat perfect little life in this huge city. My future career plans are a work-in-progress. My dream job would be to be a travel journalist, and get paid to see new cultures and experience new places. After teaching in Seoul, I will travel Asia for about a month, and then return to Toronto and start applying for jobs related to journalism. I took communication studies at Laurier. Journalism is one of the few fields in which one does not require a master’s degree to succeed. What’s necessary is strong initiative, street smarts and the ability to uncover and write important, engaging stories. Yenny certainly has the skills to write an engaging story and I encourage her to pursue her objective to become a journalist. She can, however, do a number of things to expand her international credentials – and there is no better time to accomplish this then while she is abroad. I know of a few journalists who got their start by freelancing in print and radio while living abroad (one of whom is now an anchor on the BBC). Another option is to work or intern for any one of the many English-language dailies that exist in the large cities of the world (especially in Asia). Any writing assignment while abroad is valuable: from helping an NGO write a newsletter or a funding proposal to updating a company Web site or designing a communications strategy for a local agency abroad. The general rule is that the more remote the country, the easier it is to impress people, network and find a back door into your professional field of choice. You may not make a lot of money in the beginning, but the great thing about this is that you can often subsidize your stay by teaching English. Work as a Freelance Foreign Correspondent is a great article describing all you need to know about making it abroad. Journalists for Human Rights (JHR) is a resource for finding internships, mainly in Africa. Center for Media and Peace Initiatives (CMPI) provides training of journalists and media professionals. Search MyWorldAbroad for the keyword “journalist” to uncover more resources for those interested in international journalism at home or abroad.